The French Revolution took place during the years of 1789 to 1799, a time of radical social and political upheaval due to the people’s ultimate rejection of the absolute monarchy that had ruled France for centuries. New enlightenment principles like equality, citizenship and inalienable rights masked old ideas such as the monarchy, aristocracy, and religious authority. The idea of people’s rights penetrated the masses throughout France and Europe. Analyzing the artwork produced during this time in history aids in the understanding of the struggle and true patriotism of non-aristocratic French citizens. On the eve of the French Revolution while the nobility were naively enjoying the life of luxury, theatre and visual artists were beginning their attack. By incorporating subtle rebellious innuendoes into plays, paintings, and other art forms, the middle and lower class public could voice their opinions and severe distaste for the government and nobility. These clues portrayed in the artworks were so cleverly expressed, the upper class citizens unknowingly supported their efforts. 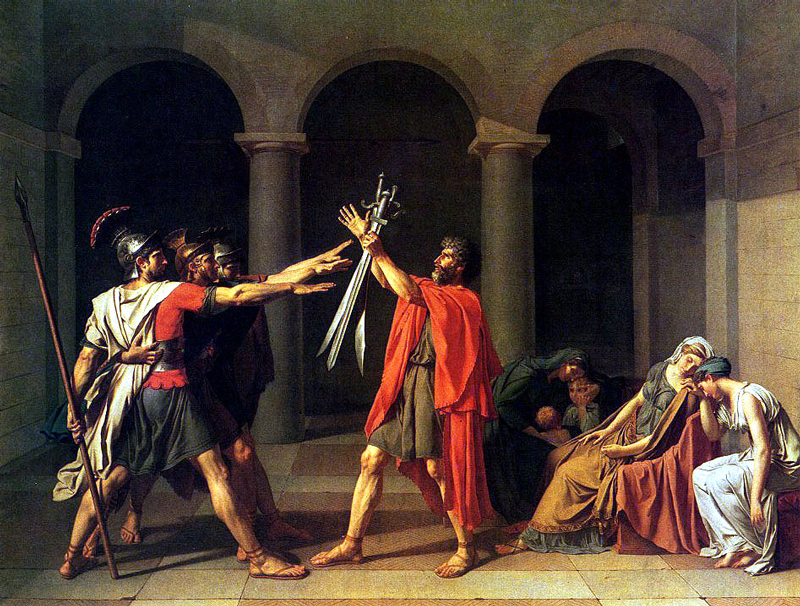 Jacques-Louis David was one such artist, a true French Patriot and artistic rebel. David was careful not to break the rules of his Academy art training. Instead he chose historical subject matter that directly reflected the changes they wanted to see in the French political system. Rejecting Rococo art and embracing the heroic and virtuous ideals from the Roman Republic, David created his most praised piece, Oath of the Horatii (1784, Louvre, Paris, France). By depicting its counter-part in the form of an Ancient Roman scene, this large-scale painting was David’s attempt to call attention to the issues in contemporary France. 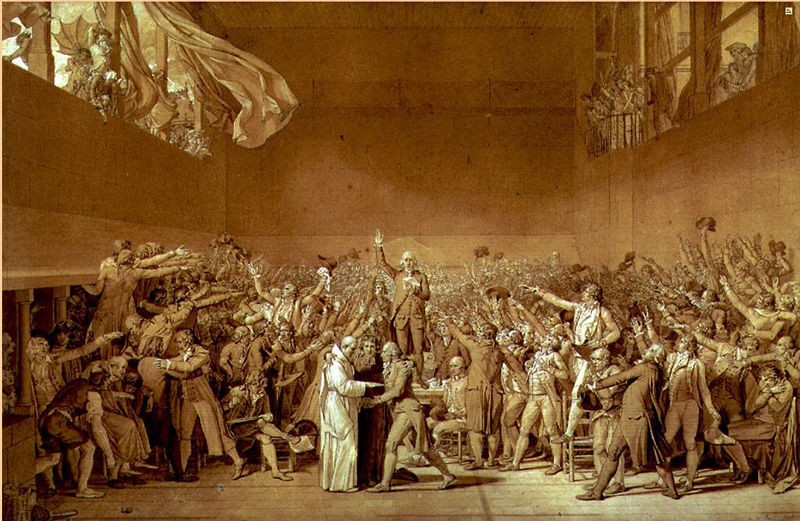 Early into the French Revolution, David created his piece, Oath of the Tennis Court (1791, Bibliothèque Nationale, Paris, France). In Oath of the Tennis Court, David aspired to capture the intensity of the virtuous and revolutionary beliefs of the greater majority in France by modeling the drawing after his already famous painting, Oath of the Horatii. There existed a growing gap between classical traditions and progressive ideas in French society, which also existed within the art world. Jacques-Louis David was a classically trained painter. He underwent the lengthy, labor intensive training that was required in the Royal Academy of Painting and Sculpture. This Academy was established under Louis XIV in order to train young and upcoming artist to honor and perpetuate the ambitions of the hierarchical force. In order to aspire to the highest rewards the state could offer, the artist would have to demonstrate his capabilities of producing classical complex narratives, such as mythological, religious, or history paintings. David strove to represent what a true citizen should be. David was painfully earnest about himself; resolute and self-contained. He was searching for virtue in his life; David did not approve of pastel, flossy eye-candy paintings being created for the aristocracy. These artworks evoked a false care-free lifestyle; which was sickening to the masses who were starving and suffering. David found hope and refuge in the powerful art of Ancient Rome. Now, Rome was in ruins; this is what happens to decadent empires. Once there had been a free Rome, the Republic. Austere, just, and packed with flinty heroes. Yet, effeminate luxury had killed it. Liberty had surrendered to despotism and the Romans had become slaves (Schama, The Power of Art: Jacques-Louis David).